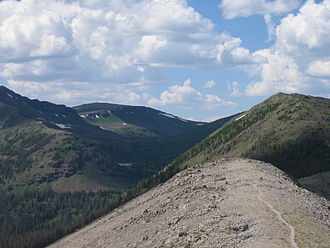 Wild Basin a region in the southeast corner Rocky Mountain National Park in Colorado, United States. The primary entrance is located north of Allenspark off State Highway 7. A dirt road leads to a ranger station, parking and horseback or hiking trails. The trail to Bluebird Lake and Ouzel Lake follows the North St. Vrain Creek (which is a tributary of the South Platte River) passing Calypso Cascades and Ouzel Falls along the way, leading to Ouzel Lake and Bluebird Lake. Both Ouzel Falls and Ouzel Lake are named after a North American species of bird, Cinclus mexicanus, also known as a dipper. Other trails lead to Thunder Lake, Finch Lake, and Pear Lake. ^ Chronic and Williams (2002). Roadside Geology of Colorado: Second Edition; Mountain Press Publishing Company. Page 211. ^ Kent and Donna Dannen (2002). Hiking Rocky Mountain National Park: Including Indian Peaks Wilderness: Ninth Edition. The Globe Pequot Press. Pages 125-132. "Wild Basin". Geographic Names Information System. United States Geological Survey. Retrieved 2013-12-24. It is 16.5 cm long and weighs on average 46 g. It has long legs, and bobs its whole body up and down during pauses as it feeds on the bottom of fast-moving and it inhabits the mountainous regions of Central America and western North America from Panama to Alaska. This species, like other dippers, is equipped with an extra eyelid called a membrane that allows it to see underwater. Dippers produce more oil than most birds, which may keep them warmer when seeking food underwater. In most of its habits, it resembles its European counterpart, the white-throated dipper, Cinclus cinclus. It feeds on insects and their larvae, including dragonfly nymphs, small crayfish. It may take fish or tadpoles. The song consists of high whistles or trills peee peee pijur pijur repeated a few times, both sexes of this bird sing year round. It defends a territory along streams. Its habit of diving underwater in search of food can make it the prey of large salmonids like bull or Dolly Varden trout. The American dippers nest is a structure with a side entrance, close to water, on a rock ledge, river bank. St. Vrain Creek is a tributary of the South Platte River, approximately 32.2 miles long, in north central Colorado in the United States. It drains part of the north of Boulder and the Colorado Piedmont area in the vicinity of Longmont. The creek is formed by the confluence of North and South St. Vrain creeks at Lyons, the creek rises in several branches in the foothills of the Front Range northwest of Boulder. Middle St. Vrain Creek rises along the divide, west of St. Vrain Mountain. It descends in canyon to flow along State Highway 7 and past Raymond and it joins the shorter South St. Vrain Creek about two miles below Raymond. South St. Vrain Creek at flood stage is a five mile Class 5+ kayak run at flood stage, North St. Vrain Creek rises northeast of St. Vrain Mountain near Allenspark and descends in a remote canyon to the east along U. S. Highway 36. The two branches join at Lyons, at the mouth of the canyon, east of Lyons, the combined stream flows southeast through farmland and ranch country, passing south of Hygiene and entering Longmont. The Agnes Vaille Shelter is a beehive-shaped stone shelter near the summit of Longs Peak in Rocky Mountain National Park, Colorado, USA. The shelter was built in 1927 by the National Park Service after a number of climbers died ascending Longs Peak, the shelter was named for Agnes Vaille, who made the first winter ascent of the east face of Longs Peak by a woman. On January 12,1925, Vaille fell 100 ft while descending the North Face, Vaille survived the fall with minor injuries, but was unable to walk. Her climbing partner, professional mountaineering guide Walter Kiener, went for help, one of the rescuers, Herbert Sortland, froze to death after breaking his hip while trying to rescue her. The stone for the shelter came from this area, the shelter consists of a single circular room with a conical ceiling formed by the walls and roof of the shelter, entered by a single door opening whose door has been removed. As a result, the interior may be filled with snow for much of summer. There are two glazed windows and one opening, and the floor is paved with stone. Remnant building site, Lulu City. Glacier National Park in September 2009. Lightning and hail storms appear with little warning in the Great Divide Basin of Wyoming; there is no place to hide. The state quarter coin for Colorado, released June 14, 2006, depicts the view of Longs Peak from the north shore of Bear Lake. Looking west over Dream Lake. 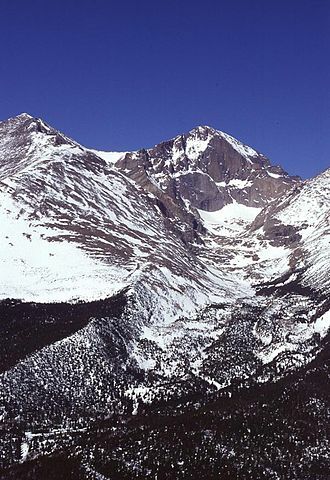 Hallett Peak is on the left with the dramatic cliff band and prominent point. Mummy Mountain from Estes Park, Colorado.